Fun fact: Seattle is home to more distilleries than any other city in America (24). Couple that with a dizzying number of local craft breweries, and you’ve got all the makings of a first-rate drinking town. Whether you’re looking for a beer-and-shot situation or a perfectly-prepared martini, here are the bars where you should wet your whistle. Tucked away in Pike Place Market, this temple to brown liquor has a bit of a speakeasy feel, but none of the now-common speakeasy attitude. In fact, owner Dan Bugge is on a mission to make the sometimes-formidable world of whiskey, fun. 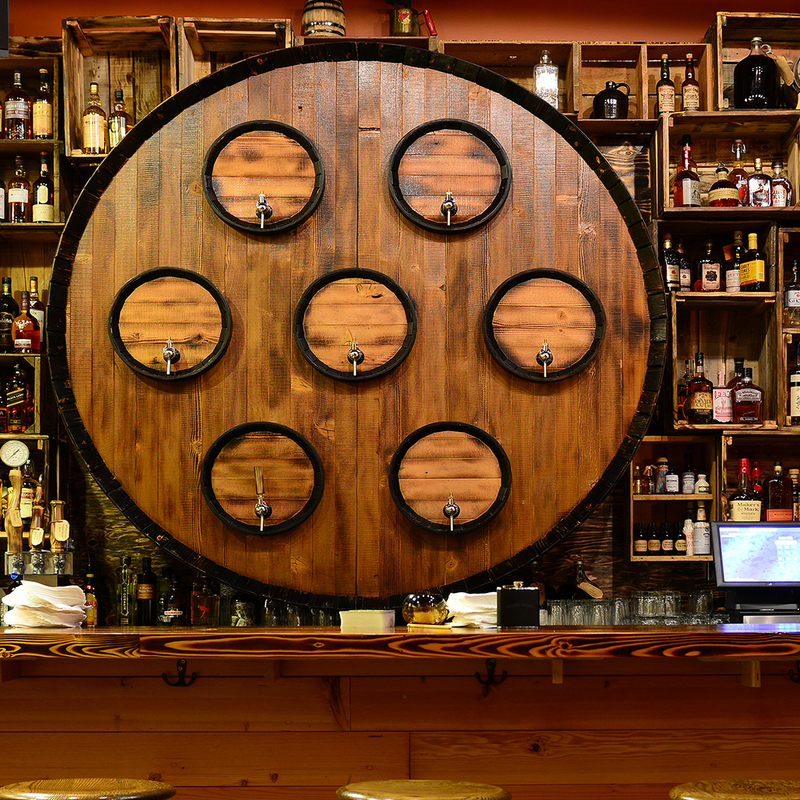 Let the friendlier-than-friendly staff help you navigate the drink menu, which features over 100 whiskeys and seven rotating barrel-aged specials. Once the drunchies kick in, order the top-selling beef lip terrine, cornflake crusted chicken livers, or smoked pig’s head. A distillery and bar in one, Sun Liquor swaps out the usual low lighting and dark decor for a blonde wood bar, booths, and a colorful, hand-painted map covering an entire wall. As for what to drink, anything made with Sun Liquor’s own gins and rums is a no-brainer. Libby’s Mai Tai, a popular carry over from Sun’s previous Capitol Hill location, is a refreshingly fruity concoction of light and dark rums with house made grenadine. This bar has plenty to be proud of – including the western hemisphere’s largest bottle collection (3,500 and counting) – but drinking here is always a relaxed, convivial affair. Though the cocktail menu is almost as extensive as the bottle list, we recommend beginning your night with a “Shrouded Roulette.” You pick the base spirit, and let your capable bartender handle the rest. Opened in 1929, this dive bar is a local treasure. For starters, it’s open 24 hours. Also, there are two happy hours: a standard one (from 4-6pm) and more infamously, an early morning version from 6-9am when you can swig well drinks for a mere $3.50, and a domestic draft for $2. (If you’re feeling more discreet, you can also have Baileys in your coffee for $5.) Good thing there’s plenty of greasy grub on hand to soak it all up. Located on the corner of 4th Avenue and Olive Way in the historic Mayflower Park Hotel, Oliver’s offers hotel guests and locals alike a relaxed, but sophisticated respite from the city. Grab a seat at the bar and chat up one of the affable bartenders, who shake and stir silky smooth, generously-sized martinis. And with its oversized windows, Oliver’s is also a terrific place to perch and people-watch. This spacious beer hall has a little bit of everything, making it ideal for groups. While German draft beers are plentiful, domestic suds make a nice showing, too. The patio is perfect for spreading out while the weather’s warm, and indoor bocce ball courts will keep you entertained when the weather’s not. There’s also plenty of hearty snacks to feed a crowd, like German-style pizza and the Grillwurstl Schmankerl, a whopping two-pound sampler of house sausages. Why should whiskey get all the love? That’s the thinking of Chad Phillips, the bar manager of this handsome cocktail den, tucked next to the lobby of the Palladian Hotel. His passion is Spanish-style gin and tonics. Phillips selects unusual garnishes, along with a house made tonic, to enhance the natural botanicals of each gin. For example: He garnishes the gin from Copperworks, a local distillery, with orange peel and star anise.